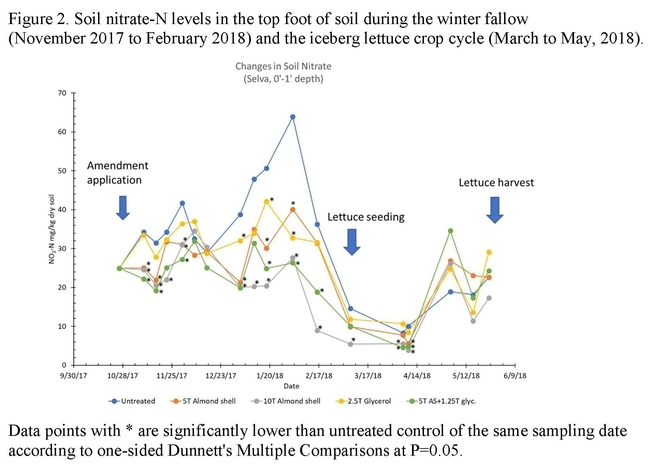 Summary: Following the crop production season in the fall, residual soil nitrate-nitrogen (N) levels increase when N-rich residues from crops such as broccoli are incorporated into the soil. Soil temperatures in the fall and early winter are adequate to allow decomposition of crop residues, as well as mineralization of soil organic matter. The resulting pool of residual soil nitrate-N is vulnerable to leaching by winter rains. Winter-grown cover crops trap a significant portion of this nitrate in their crop biomass thereby providing a useful practice to reduce nitrate leaching during the winter fallow period; however, although growers may want to include cover crops in their rotations, conflicts with spring planting schedules and high land rents often preclude their use. Over the past two years we have conducted trials to evaluate the potential of using high carbon/nitrogen (C:N) organic amendments during the winter fallow period to immobilize (tie up) soil nitrate-N and reduce leaching. Soil microbes utilize the supplemental carbon and available soil nitrate for their growth, thereby reducing the pool of nitrate in the soil that is susceptible to leaching. On the Central Coast, fall compost applications is a common practice used by many growers. We were interested in determining whether a high C:N amendment could be substituted for compost to immobilize soil nitrate-N during the winter fallow and serve as a best management practice (BMP) to reduce nitrate leaching. During the winter of 2016-17 we evaluated the impact of a high C:N green waste mulch (GWM) (C:N 31.4) on nitrate-N leaching following a fall broccoli crop. 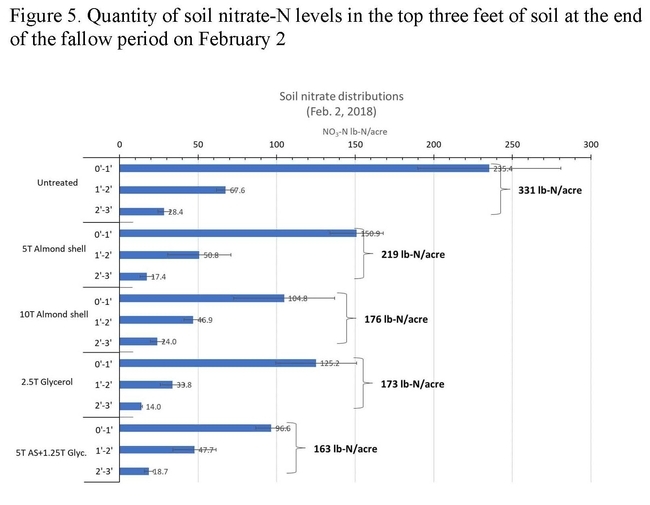 No reduction in soil nitrate-N was observed with 5 or 10 tons/A of GWM. The lack of efficacy was probably due to the coarseness of the GWM particles, which were too big to provide soil microbes with sufficient carbon quick enough to utilize and effectively immobile soil nitrate-N. During the winter of 2017-18 we evaluated almond shells (C:N 70.3), ground to 0.5 millimeters in size, and applied at 5 and 10 tons/acre, as well as 2.50 tons/acre of glycerol, and 1.25 tons/acre of glycerol + 5 tons/acre of ground almond shells. 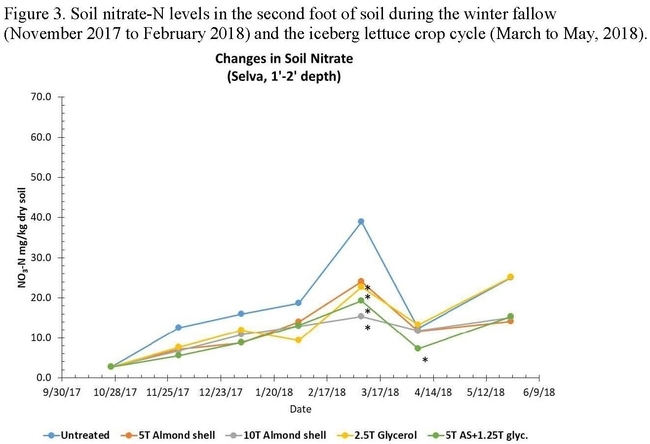 At the end of the winter fallow period, all these materials reduced the load of nitrate-N in the top three feet of soil by nearly half compared to the untreated control. 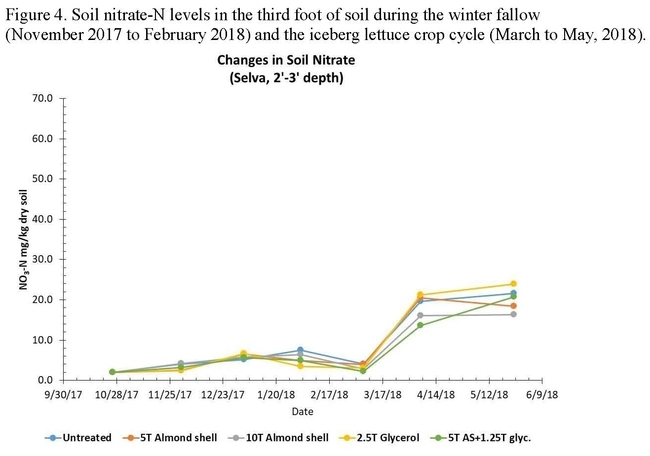 Almond shells applied at 10 tons/acre significantly reduced the subsequent lettuce crop yield, presumably because it continued to immobilize nitrate during the cropping season. The other treatments did not significantly reduce crop yield. 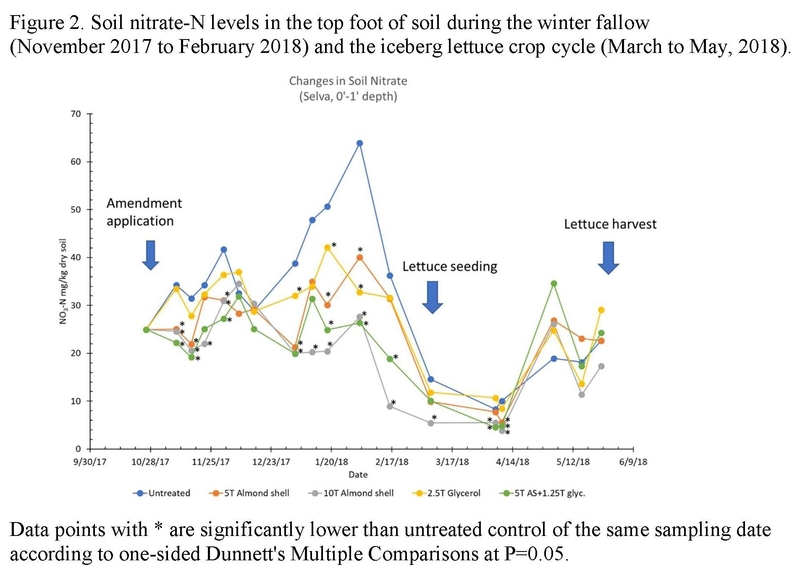 These data show promise for winter fallow immobilization of nitrate as a viable BMP that growers could utilize to help reduce nitrate leaching during the winter fallow without substantially changing other production practices. However, there are aspects of this practice that we still need to understand to effectively reduce nitrate leaching, safeguard yields and minimize cost differences between standard compost applications and the high carbon amendments. The costs of the high-carbon materials used in these studies ranged from $270 and $720 more per acre than the standard grower treatment; subsequent experiments will need to focus on test materials that have costs that are closer to standard compost application to be a realistic option for growers to consider and routinely utilize. In future testing of GWM, particle size will need to be small enough to allow soil microbes to obtain sufficient C to drive the immobilization process during the winter. Methods: The trial was established in a commercial vegetable production field west of Gonzales, CA on a site with Mocho silty clay loam soil. In the 2017 production season romaine lettuce was produced in the spring through early summer and broccoli was grown from mid-summer through fall. The N content of the broccoli residues at harvest was measured on October 4. After harvest, crop residue was mowed and disced, and the land was prepared for winter beds according to standard practices in the Salinas Valley (discing, ripping to three feet deep, chiseling and land planing). Tillage was complete on October 23 and 350 lbs/acre of 6-20-20 (21 lbs N/acre) was applied on October 24, 2017. On October 28, ground almond shells (C:N 70.3, Table 1), were applied with a commercial spreading truck at three rates: 0 (untreated control), 5 and 10 tons/acre. Each plot was 20 feet wide (the width of throw of the applicator) by 100 feet long. The plots were arranged in a randomized complete block design with four replications. Following the ground almond shell application, the field was chiseled and then listed into peaked 40-inch wide winter beds. Glycerol treatments were applied to the listed beds at 1.25 and 2.50 tons/acre (240 and 479 gallons/acre, respectively) on October 30 with a commercial spray rig. Before application, glycerol was diluted with water at a ratio of 1:1. All treatments were then lillistoned into the beds. 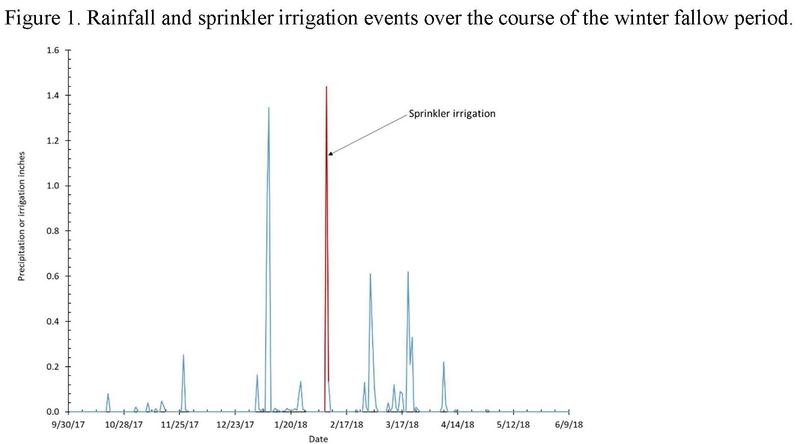 Drain Gauge G3 lysimeters from Decagon were installed in the untreated control and the 10 ton/acre almond shell treatment on October 30 after the fields were lillistoned They were capable of measuring nitrate leaching down to a depth of six feet. Sample of drainage water would have been collected after each rainfall event. 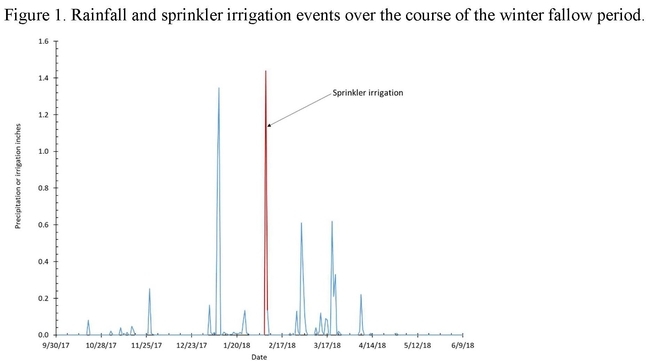 However, the rainfall was insufficient to generate drainage and sprinkler pipe was installed in early February and 1.5 inches of irrigation water was applied to simulate rainfall. The lysimeters were removed on February 22, 2018 prior to planting the lettuce. Rainfall totals for winter of 2017-18 were retrieved from the Soledad CIMIS weather station (Figure 1). Soil temperature at the CIMIS station was in a range of 50 to 60 °F during the evaluation period. Soil samples were collected from the top three feet of soil each month during the fallow period from November 2017 to February 2018 and during the subsequent lettuce crop cycle (March to May 2018). Soil samples were extracted with 2M KCl and analyzed for nitrate and ammonium. Following the winter-fallow period, iceberg lettuce was planted on March 7, 2018. The anti-crustant 6-16-0 supplied 24 lbs N/acre. Crop biomass and biomass N uptake were measured on May 9. Yield of the iceberg lettuce was evaluated on May 25 by harvesting 36 heads per plot for crop biomass and biomass N accumulation.